What is the link between Apple Inc. and our local Chalet RoyAlp Hotel and Spa? They both deal with operation budgets, staff management, product design and sales, consumer care, and bottom line profits. The study of business, international business management, and hospitality have subtle similarities and could position a young person with the background they require to work at either. At Aiglon, a good portion of our students are keen to study economics, business or hospitality paths after graduation; last year, 35% pursued a bachelor degree programme in one of those three areas. The academic study of hospitality at the university level incorporates all elements of the traditional business degree but with an added layer of vision, hands-on experience, accountability, and unique management skills. Aiglon students are primed with international exposure and experiences either from birth or from their time in our dynamic boarding community. They are linguistically talented, culturally aware, and have learned life-long personal and academic skills by the conclusion of the IB programme. Some have opportunities awaiting them in a family company, while others strive to satisfy their entrepreneurial spirit. In all cases, they seek an undergraduate education providing a strong and reputable foundation. The University of London began offering bachelor of science (B.S. or B.Sc.) degrees in 1860, causing a divide with the long-standing tradition of the bachelor of arts (B.A.) degree. Today. the main difference between the two degrees is that the B.Sc. incorporates more technical orientation and practical experience compared to the B.A., which covers more theoretical knowledge. Earning a business management degree (with a focus in international business or hospitality) guarantees an education in practical elements and theory behind operations and staff management with nuanced intercultural and customer service related concepts. Regardless, serious students dreaming of high-level positions in the world of business will usually consider a master of business administration (MBA) to be most competitive in the employment market. 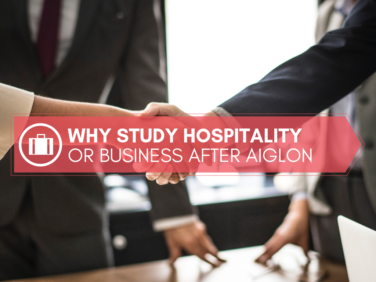 Aiglon graduates have attended programmes ranked in the top 10 for hospitality and business management degrees worldwide, including Ecole Hôtelière de Lausanne (EHL), Cornell University, and Glion Institute of Higher Education. Some of the more popular destinations for business management (including international business) for alums have included Babson, Bentley, Claremont McKenna College, Northeastern University, Stanford, UC Berkeley, UCLA, UPENN, University of Southern California, and Bocconi University, Cass Business School- City University London, Erasmus University Rotterdam, IE University and University of St. Gallen to name just a few.